The Halifax Resolves Chapter NC SAR recently conducted their Enhanced JROTC Scholarship contest. 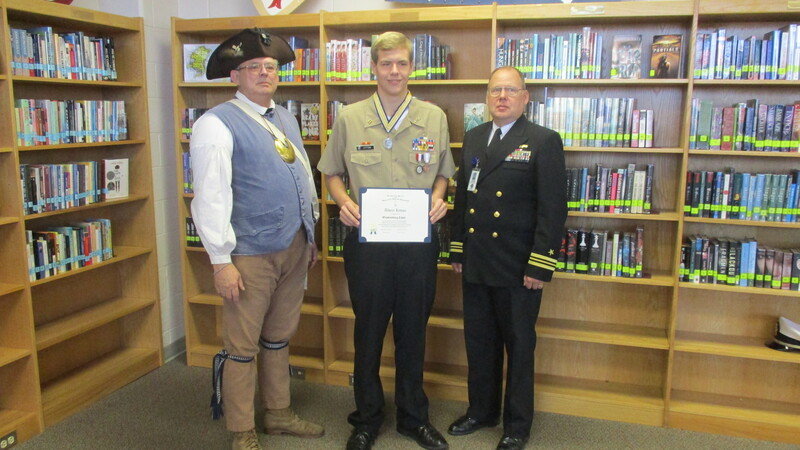 Cadet Lt. Albert J. Lytton from the Naval JROTC unit at Nash Central HS was selected as the chapter winner. His entry has been sent forward to the state level competition for consideration. A candidate for this competition must be recommended by the Senior JROTC Instructor with specific comments about the Cadet’s leadership potential. A recommendation from the Principal confirming a GPA and class standing in the top 10% is also required. The cadet must then write an essay of 500-700 words entitled “How JROTC has prepared me to be a better citizen of the United States of America”. Cadet Lytton received an Olympic style medal, with a ribbon for his ribbon bar; a chapter level winner’s certificate and a check for $100.00. The presentation was made by Halifax Resolves Compatriot Ken Wilson. Nash Central HS Naval JROTC instructors are LCMDR. Carther F. Jorgensen, USN (ret.) and Sgt. Maj. Leonides Nieves, Jr., USMC (ret. ).